The unequal distribution of health and social status across the EU poses a challenge to the EU‘s fundamental objective of solidarity and cohesion, and to secure sustainability a focus on prevention is essential. Alarmingly, 97% of health spending across Europe goes on treatment as compared to only 3% on prevention. Whilst Prevention Science is a relatively new field of study, it is one that is growing in importance across the European Union. The growing number of fiscal, environmental and social pressures facing the EU is forcing policy makers to search for more effective and efficient ways of dealing with particular societal problems and issues. And strong evidence-based early intervention and prevention programmes can deliver important societal benefits, with returns on investment (ROI) far exceeding benefits achieved with later interventions and treatments. More investment in prevention, and in Prevention Science, is warranted. 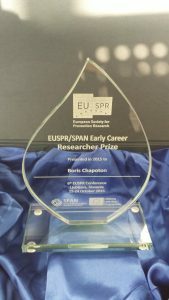 The Science for Prevention Academic Network (SPAN) (www.span-europe.eu) was initially funded by a three year Academic Network grant from the European Commission and involved 32 institutions across 25 European countries. SPAN aims to improve the integration of Prevention Science in the higher education sector and to improve skill mobility across Europe. 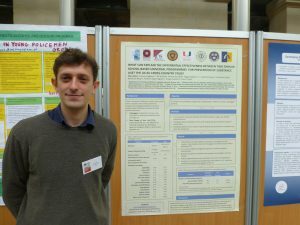 SPAN has analysed the requirements of those working and studying in the Prevention Science field, prepared a proposal for the implementation of a post-graduate level curriculum in Prevention Science, and an explanation of how the curriculum is designed to meet the needs of prevention scientists, researchers and practitioners. At the start of the SPAN project, we outlined a number of areas where developments and improvements in Prevention Science could be useful for substantive EU concerns: public health, nutrition and physical activity, drug and alcohol issues, non-communicable disease, sexual health and HIV, mental health, environmental health, crime, pollution prevention and control, health and safety at work, and road safety. Our emphasis, in this first phase, has been to establish an academic network that draws together prevention scientists and practitioners, maps activities and needs in the research and education sectors, identifies and supports early career prevention scientists, and sets out quality standards and frameworks for Prevention Science education. We have achieved all of this and more: we have also linked with a global initiative to improve training for the prevention workforce; we have worked to embed SPAN within the European Society for Prevention Research (EUSPR) to ensure sustainability beyond the end of current funding; and we have promoted our findings and recommendations within the European Commission and the European Parliament and across the EU. Moreover, SPAN has developed over the timescale of this project so that it now has emergent network properties, with members communicating and collaborating on initiatives without any central co-ordination. One of the key objectives of SPAN was to map prevention education courses, modules and programmes. An electronic survey was distributed to 353 research groups, scientists and researchers from 40 countries. Further participants were recruited within each country via a snowball technique. The education part of the SPAN survey obtained reports from 97 courses from 59 respondents over 26 countries. For 90 courses in 21 countries the language of delivery is mentioned, in total 16 different languages. Six courses are given in the United Kingdom, but twenty-four courses are given in English, plus four in English and another language. The majority of courses (68/71) included information about European Credit Transfer System (ECTS) credits. Some courses included work experience placements. The most important working areas of respondents, besides prevention, are psychology, public health, health promotion, education and epidemiology. Course topics cover in order of importance: public health, behavioural problems, mental health promotion, alcohol and illicit drug abuse, behavioural or lifestyle aspects. 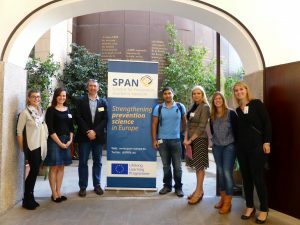 Another important objective of SPAN was to understand the workforce needs of current employers of prevention workers across Europe (including prevention scientists, researchers, policy-makers and practitioners). For this research we surveyed the needs of a range of Prevention Science and policy specialists, research organisations and organisations delivering prevention support programmes. More than 80% of SPAN survey respondents think that basic knowledge and skills (such as theoretical background/research findings, programme analysis and needs/resources assessment, programme logic models, programme implementation quality, programme evaluation, ethics in prevention) are important for the prevention workforce, but also report that there is a significant gap in knowledge and skills. The survey also showed a strong need to invest in prevention education/training regarding advocacy for quality prevention, funding, management skills and soft skills such as communication, teamwork, collaboration and networking. SPAN also described the ongoing activity and the perceived development needs among researchers and research groups in the EU. In survey responses from 26 countries, three thematic areas accounted for 53% of the responses about the research group’s research focus: behavioural problems, mental health and substance abuse. Funding sources were external grants (44%) and government (33%) with just 16% of the answers referring to University funding. The most frequently cited needs for improved quality of prevention research referred to the scientific basis of: intervention evaluation (18%); intervention implementation (17%); intervention development (13%) and policy interventions (13%). Development of general disciplinary skills (epidemiology, qualitative and quantitative methods in prevention research) was cited in 8% of the answers. Notably, most research dealt with interventions aimed at behavioural and psycho-social determinants of health, a field not included in traditional public health, therefore probably requiring new methodological approaches. In line with this, strategic directions for development concerned “applied” methodological domains (evaluation and implementation research) rather than general disciplinary methods. A key outcome of the SPAN project was the production of a Quality Plan for consistent development of Prevention Science in higher education in Europe. We found only a few dedicated Prevention Science courses in Europe, although relevant modules and topics were incorporated into many other higher education courses, with a high level of ECTS integration. Responses from junior researchers showed that capability in Prevention Science research across Europe could be improved by enhancing education and training provision in several areas, including intervention development, implementation and evaluation, policy research, qualitative and quantitative methods, and epidemiology. The Quality Plan is a SPAN product that translates quality policy into measurable objectives and requirements, and outlines a sequence of steps for carrying out tasks within a specified timeframe. The Quality Plan sets out the policy, framework and tasks that are required in order to improve the integration of Prevention Science education / degree across Europe. Another important focus of SPAN was the preparation of an ECTS (European Credit Transfer System) action plan. Five ECTS information packages were compiled from Oxford Brookes University (UK), Vilnius University (Lithuania), University of Zagreb (Croatia), Karolinska Institute (Sweden) and University of Bremen (Germany). A total of 25 courses were included in the ECTS information packages; 20 of them at graduate level. Eight courses are taught in English and the remaining courses are typically taught in languages other than English. Eleven of the courses included in the information packages are offered as ‘full time taught’ courses and another 11 were described as ‘full time taught and research’ courses. Only three of the courses presented offer flexibility: one is offered as ‘full time taught’ or ‘part time (day, taught)’ while the other two are distance learning courses that can be pursued full time or part time. Overall, we found that two of the major factors limiting integration of Prevention Science education and restricting mobility of students and academics are the language barrier and the lack of flexibility in the teaching methods employed. Funding agencies, scientific and professional organisations should encourage higher education institutions to update the SPAN online database with latest details of their Prevention Science courses, including self-assessment against the Quality Plan and the ECTS action plan. Funding agencies, scientific and professional organisations should encourage higher education institutions to improve their Prevention Science provision where gaps are identified and needs are not met. Existing Course content should be translated and delivered in English so as to overcome the language barrier and lessen the issue of imbalanced mobility. Digital infrastructure should be developed and courses re-designed so as to incorporate virtual learning together with traditional face-to-face teaching, thus increasing the opportunity for students to take up courses offered by different institutions across Europe. The necessary competencies for prevention scientists should be established using the ECTS templates developed in the SPAN project in order to set up transferable European qualifications for prevention scientists in Europe. H2020 and its successor should prioritise the alignment and development of prevention research, so that national and European entities devote financial resources to high quality prevention research. Applied interdisciplinary research should be encouraged in higher education settings, for example the scientific basis for prevention intervention development, evaluation and implementation. Exchange of methodological expertise should be fostered between researchers and research groups in EU countries, in both applied and general disciplines. Skills for health policy interventions and their evaluation should be developed as a priority area. Amongst the prevention workforce, in multiple sectors, there is a strong need to invest in comprehensive and recognised professional development activities and programmes.